This week Mr. Waterstone, Jr. came home. Along with dirty laundry and a truck full of stuff, he brought a TON of vegetables. My eldest has a mad green thumb and he's quite proud of it. Now this is where you come in. I need your help. I have peppers as far as the eye can see - all sorts of peppers. I have apples from a beautiful orchard and I have absolutely NO IDEA what to do with them because as you well know, I am no cook. Please help a girl out. 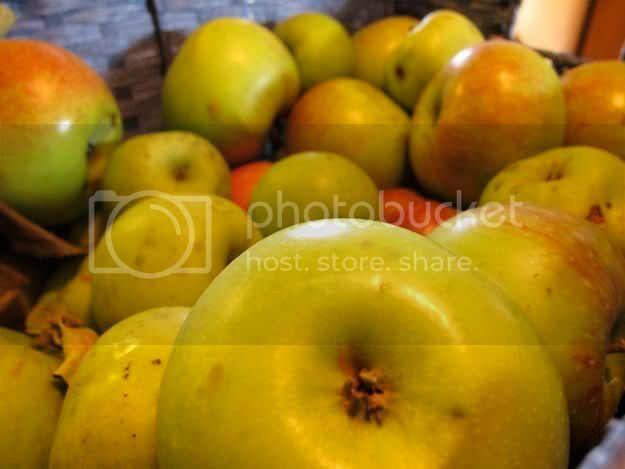 What do I do with a HUGE basket of apples? ...two flowers in black and brown leather - ALL recycled. 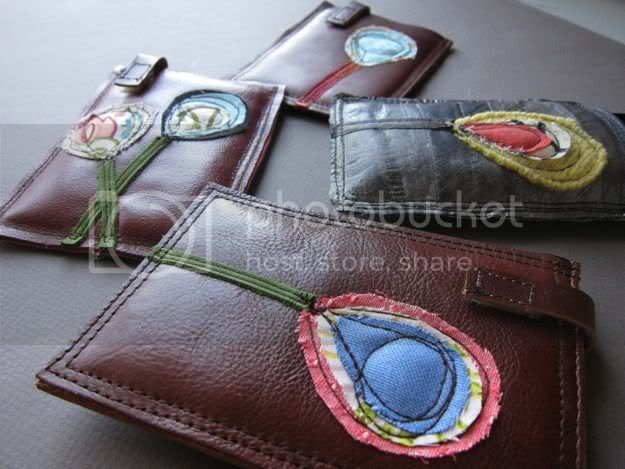 The lining is recycled blue cotton with six pockets, five regular-sized and one for a pen or pencil. It's lightweight and ideally sized. Did I say that I love this? I do. So that's what I accomplished this past week, aside from the ridiculous studio reorganization. Doesn't sound like very much, but it felt good. We're enjoying weekend guests and as a result have young adults running all through the house. How about you? Special plans this Labor Day weekend? Please don't forget. Do you have any pepper or apple suggestions? Gorgeous suede bag... I am partial to suede, myself... you just have to be so careful - it get dirty fast. oh.. and both freeze well. If you can make applesauce then you can put it in zippy freezer bags and freeze it. I don't know what kind of utensils you have since you say you don't cook. After you see all of the suggestions you can ask for more details if needed. Good luck. Hey! Sorry, I've been way behind on my blog hopping. Had a lot on my plate lately. Anyhow, the peppers are GORGEOUS! I wish I had some suggestions for you about what to do with them but I really don't have any. Love your new creations. Looks like you've been hard at work. Hope you have a great holiday weekend! Apples can be baked...core them and add butter with cinnamon and nutmeg (whatever spices you like) and then bake until they are done! A sweet yummy treat! Great with a scoop of ice cream! That bag is gorgeous! As for those apples, my suggestion is to make some apple sauce (it's great to bake with--use it as a replacement to butter--we use it when making brownies, muffins or any kind of fruit bread and it's always moist and delicious). Also, go go allrecipes.com (it's my favorite recipe website) and look up recipes like apple muffins, apple spice cake, apple pancakes, etc. That's how we use up apples that are getting soft and past the point of eating fresh. And one last recipe that we use a lot in the fall is ravioli with apple and walnuts (from Real Simple)---cook cheese ravioli and toast chopped walnuts (1/2 c) in olive oil (1 tbsp), when walnuts are almost done throw in apple (cut like matchsticks) and sprinkle with 1/2 cup parsley. Toss the apples/walnut/parsley mixture over the cheese ravioli. It is so good and so easy! Yay! Great suggestions. I'll be cooking me some apples today. Thanks. Knew I could count on you guys. I would make apple sauce, apple butter, and apple chips. And then I would pickle some peppers! I LOVE pickled peppers. Poke a hole in each pepper with a knife. Throw in pan toss with olive oil, salt pepper.You can throw in other stuff too. Coat the peppers and put in oven @ 350 for about 45 minutes. Maybe longer if you have a ton of peppers. They will collapse and have a nice color on them when they are done. They turn roasty and soft YUM !!! They last a few weeks in the fridge .....now I'm hungry. Salsa! Of course I don't cook so I can't give you any advice on how to make it. Or you could go to the Farmer's Market to sell or set up a "Pepper Stand" instead of "Lemonda Stand" and sell peppers. 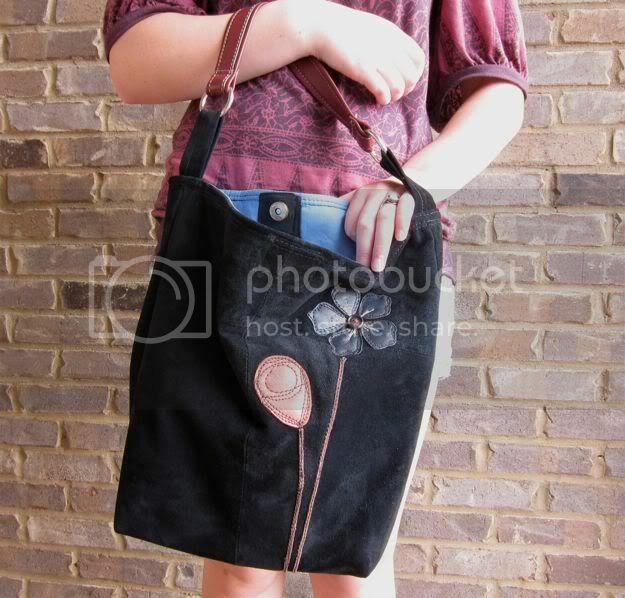 Love, love, love the black suede purse with the hibiscus. I could carry so much stuff in the bag (love over sized bags). I hope you have a great holiday weekend. I am off to torch. Peppers - thin skinned ones you can dry for long-term use. When dry, crumble up or - grind with a coffee grinder (not for coffee anymore!) To dry - lay out on a window screen or baking/cooling rack in the sun or in a low oven (instructions online somewhere, it's simple). Apples - chop up and cook like folks said, no peeling or coring necessary - 20 min. I got a ricer at the hardware store to smoosh it all up with and it takes the skin away. = applesauce quick! I'm pretty sure you can just bag and freeze it after that. We just eat it all or gift it pretty quick. 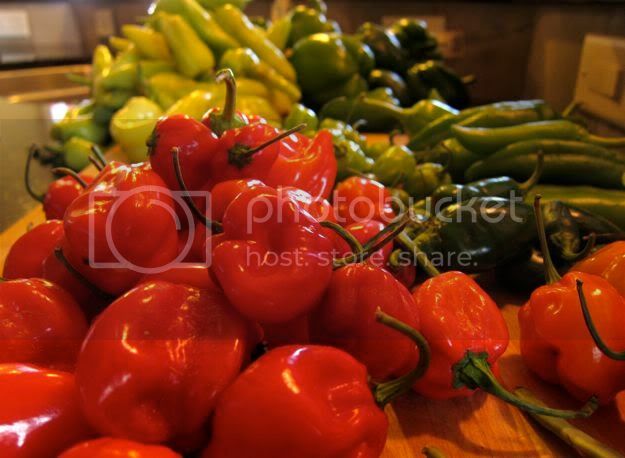 You can freeze some of the peppers and use them in stir fries or meat dishes. You can make applesauce (or apple pies) and freeze those, too. Yum. great bag and cellphone holder projects!